For three consecutive years, I had the opportunity to interview the Chair of the Board of the New America Alliance (NAA) Institute Ana Maria Fernandez-Haar at their annual Wall Street Summit. Having done hundreds of political and business Latino leaders’ interviews, Ana Maria’s friendly personality and savvy approach to the topics at hand made my work extremely easy every time. This year, NAA’s 15th Anniversary took central stage. 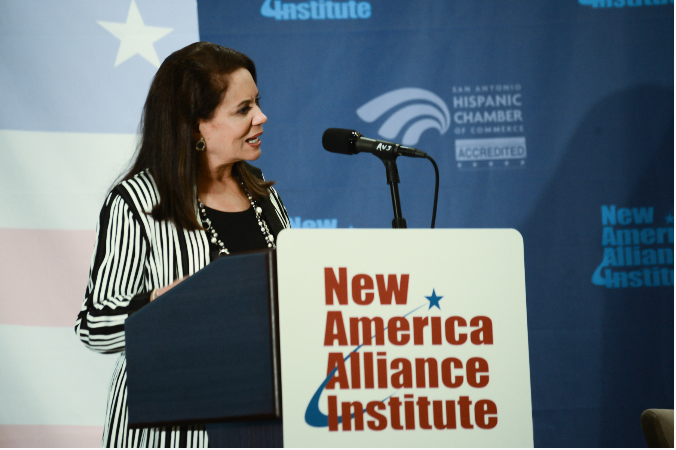 Looking back as one of the leaders who was involved in the organization since its inception, Ana Maria believes issues related to Latino political and economic participation are still on the table; however, Latino representation cannot be underestimated. We have made great progress, especially among Hispanic women. Fifteen years at the NAA give her a unique perspective and time frame from which to evaluate progress. “We live in a data and research-driven environment where no detail of consumer or voter behavior seems too insignificant to measure. Yet at the same time, the democratization of information through social media platforms such as YouTube, Facebook, Twitter or Instagram has created countless new ways to communicate and connect. All the messages and images are out there, constantly shaping the perceptions that weave the very tapestry of our society,” she said. Looking at all research available, from the U.S. Census Bureau, Nielsen reports, The Pew Hispanic Center, the Hispanic Association of Colleges and Universities (HACU) and other reliable sources, they show extremely favorable trends for Hispanics, Ana Maria believes. Their consumer, political and economic clout is clearly on the rise. According to 2013 Census Bureau figures, the drop in the poverty rate among Hispanics – from 25.6 percent in 2012 to 23.5 percent in 2013 and the only demographic group to have increased its economic power–, has impacted the decline in the nation’s overall poverty rate for the first time since 2006.
Who are the Latina pioneers? “Especially for U.S. Latinas, the future looks promising. Many of our NAA female founding members broke glass ceilings on their own. In fact, Pilar Avila, our first Executive Director, was deemed to be CEO material from the start. It came to pass,” she said. “In 1999, a Latina Supreme Court Justice seemed but a dream. Justice Sonia Sotomayor has since inspired legions of American Latinas who can now see themselves in law careers. Latinas in business can have a role model in Maria Contreras-Sweet, the head of the Small Business Administration (SBA), and a NAA member. Her inspiring story has already impacted Latinas in banking and now she’ll show the way from a larger platform,” Ana Maria stated. This progress in no small part is due to their achievement in higher educational attainments. Dr. Antonia Novello, the first Latina Surgeon General, was an unusual occurrence in 1990, Ana Maria recalls. Today, Elena Rios, MD, is the President and CEO of the National Hispanic Medical Association, surrounded by many other Latina physicians. “On a personal note, when I was 12 years old I couldn’t even imagine a Latina such as Anna Maria Chavez leading the Girl Scouts. If I had, perhaps I wouldn’t have felt so intimidated. Nely Galan’s Adelante Movement is also making a huge difference. She is business, leadership and service in action. And so it goes,” she shared. As a former marketer, Ana Maria never underestimates the power of role models, for that is the first way most young women feel validated and inspired when considering their own paths towards success. If they remain invisible among the high achievers –with media visibility as a measure in the wider society–, that is a message in and of itself. “But what they see in their own environments counts just as much. No doubt, those who were ‘first’ to arrive are often considered icons; perhaps even statistical outliers. Still, what it possible for one is possible for others. That is a very powerful message, and the message that all NAA women convey every day,” she said. In the Latina universe those positive representations are increasing much more rapidly now; for instance, among Fortune 500 CEOs, only 50 are women, four are women of color, none Latina. “But if we look at the pipeline, we cannot help to be impressed with the powerful Latinas already in place. That is not counting those making their mark in STEM, tech entrepreneurs, elected office and other areas of government,” she said. In private industry, women are assuming CEO positions in family enterprises, which used to be unheard. “Remember when companies were named with the family name and added, ‘e hijos’ (and sons)? Adriana Cisneros now leads the Cisneros Group, global leader in media and entertainment, and Doreen Dominguez does the same for the Vanir Construction Group. As I have noted, there is progress on every front,” she remarked. Political gains also merit mentioning: Susana Martinez, an attorney and governor of New Mexico; Leticia R. San Miguel Van de Putte, a pharmacist and Texas Senator representing the 26th District in San Antonio, and Nelda Martinez, Mayor of Corpus Christie, TX. “Look at these mid-term elections, a record number of women will serve in the incoming Congress!” she said. And Ana Maria’s last thought, “Every Latina in the United States is connected to Latin America in some way. So while we wait for the first woman to become U.S. President, we should keep in mind Latin American presidents such as Cristina Fernandez, Dilma Rousseff, Laura Chinchilla, Michelle Bachelet or think back to Violeta Chamorro. Could this be considered predictive?” she concluded.